For wide scale projects such as rail installations, which can require up to 3 weeks, SEFAC will be your partner and will support you throughout the duration of the installation project. SEFAC will act as consultant on the implementation of your equipment. Following the exchanges, your SEFAC contact will give you a standard proposal including civil engineering recommendations. Once the project has been approved and the work carried out, the columns can be installed in your workshop. Installation includes positioning the columns, as well as connections to the power network with the layout of cable trays or by threading the cables into integrated power networks. The junction with the control box panel marks the completion of that operation. 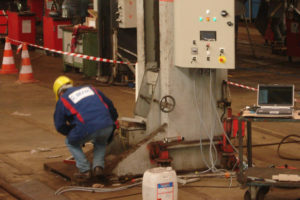 Even though our products are systematically tested prior to leaving the plant, our technical team will carry out a new testing phase as well as onsite adjustments to ensure that the equipment suffered no damage during transport. Lastly, training is provided to future users by the technicians.